Thermal circuit pools, steam, hydrotherapy, swimming pool and more!! It is recommended that you bring walking shoes, hat, sunglasses, and a camera. 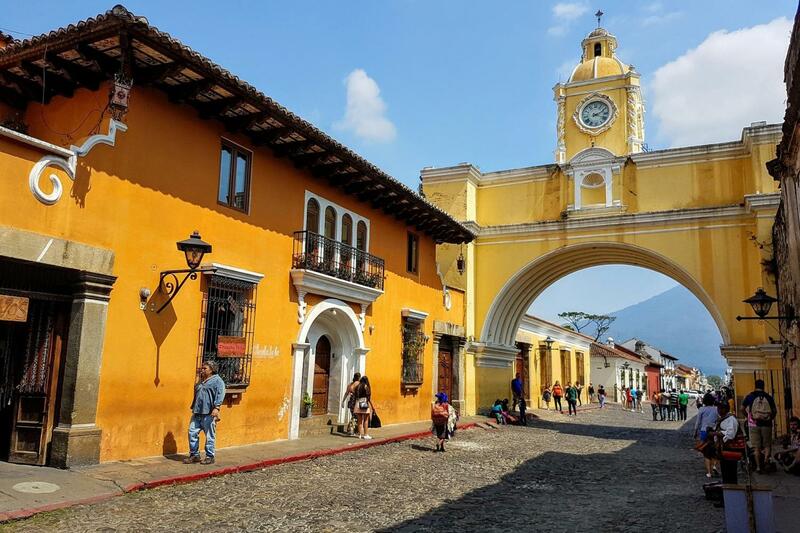 Antigua Guatemala, Once the third largest city in all of Spanish Colonial America and for 200 years the capital of Guatemala, it is today a peaceful, beautiful and partially restored colonial city. Cobblestone streets wind through the city of majestic churches and monasteries. You will be pick up at your hotel in Guatemala City and transfer to Antigua Guatemala to meet our local guide to begin your soft walking of approximately 3 hours below a brief summary of what to expect on your way. We will start our tour visiting the church of La Merced of Guatemalan Ultrabaroque style, this temple has two bell towers. On the facade of the church, in its upper part is a sculpture of San Pedro Nolasco, founder of the Mercedarian Order. Continuing our walking we will visit the Arch of Santa Catalina, built to connect the nuns between cloisters to avoid being seen due to the votes that the religious who belonged to that Order took, After the earthquakes of 1773, the arch became important due to the arrangements that were made. These arrangements included the construction of a turret and the inclusion of a Lamy Amp Lacroix watch of French origin. We will visit the Central Park surrounded by the traditional grid pattern used frequently in urban planning in the Spanish colonies. The park is surrounded by the Palace of the General Captains, the Town Hall, the Cathedral of San Jose and the Trade Portal. Here in the park, we will also find the Las Sirenas fountain. This fountain has a traditional oral where the Count of La Gomera ordered to build the fountain in memory of his daughters, who in giving birth did not want to breastfeed their children for what the count ordered To tie his daughters to a trunk in the center of a waterhole, where they died of thirst and hunger. Continue our way we will visit the La Unión tank, which is one of the most representative laundries in this city, only the big houses had a place where they could be washed. For this reason, most of the inhabitants - housewives - went to public laundries. This was inaugurated on February 3, 1853. At the end of our walking transfer to Hot Springs where we can enjoy the properties of them. Kawilal is a world of relaxation, where the most important elements of nature are present in this unique place of thermal waters, in our environment are the mixed fire and heat of the Pacaya volcano that gives us the thermal waters and vapors. It has a complex that promotes sustainable tourism in our country, and has 12 thermal pools, thermal circuit, steam baths, 25 and 3 Hydrotherapy Baths. The Spa offers relaxing massages, Reflexology, Shiatsu for relaxation, manicures and pedicures, among others. At the end of the visit, transfer to Guatemala City via Antigua Guatemala.